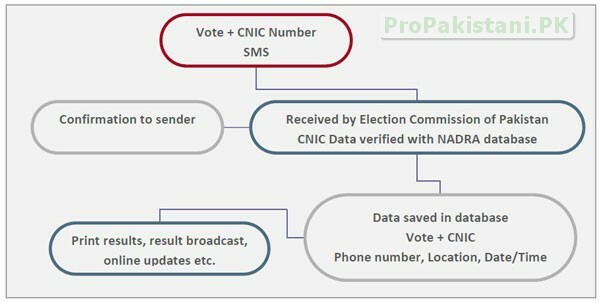 SMS based electoral system, a self explanatory idea was first proposed at ProPakistani, where Jabran rafique, in detail, explained this revolutionary idea on how can we make this into practice. To review in a nut shell, the idea was to develop a voting system for elections that will work via SMS service, where the CNIC number of the voter will be used to get his/her identity via NADRA. Working on the similar grounds, Imran Khan, Chairman PTI (Pakistan Tehreek-e-Insaaf) has filed a constitutional petition in Supreme Court, whereby he proposed Election Commission to introduce electronic voting machines. One may opine here that it is different thing as compared with the SMS Based Electoral System but the sole purpose behind the idea is same. To make the system more efficient, clean and bogus free, voter is to be verified via National Database and Registration Authority (NADRA) using the electronic system to make the vote casting process, as cleaner as it can be. The idea was well explained through the following flow chart, on how a voter can be identified as well as verified from NADRA so that once he has casted the vote, he is not able to vote again and only exact and accurate number of votes may be counted for the results. The petition is filed under the Article 184(3) through advocate Hamid Khan, where he prayed to direct the election commission of Pakistan to introduce eltronic rolls, which will help in making the system white as well as efficient. He prayed that the new electoral rolls should be introduced in a manner that should include the name of voter in such electoral area wherein his address mentioned on the CNIC exists. On a personal note, this system, in doubt, has many fruitful outcomes as well as the eradication of different kinds of frauds and mishaps but one point that may lead the idea to the “files” is that in an under developing country where load-shedding is a big problem, these machines may face electricity issues in some areas, though can be overcome using the generators and other resources but huge capital is required to implement the system. Whereas the idea, earlier given, SMS Based Electoral System is much easier to implement and is more hassle free. i agreeeeeeeeeeeeeeeeeeeeeeeeeeeeeeeeeeeee with this opinion of Imran KHan ……..
Pakistan’s CNIC has thumb impression data base which can be used to tackle this issue in case of voting machines as proposed by Imran. Also picture database can be made available to election officers. In case of voting by SMS- yes, there are too many possible frauds. Stolen CNICs, capability to send SMS with wrong CLI from internet etc. CNIC number is mentioned but mother’s name,place of birth is not mentioned on CNIC card…. sms voting is a good idea but it wil be real harder to implement in rural areas. as people can be forced to cast vote to waderaas of the area. confirmation to sender should be changed in this system. develop some other method of confirming. so that people cant be forced to vote or even if they are they can change vote. (in some time frame). no system is expensive if it could bring REAL ELECTED people in assembly! GREAT WORK BY IMRAN KHAN.I THINK ALL POLITICAL PARTIES SHOULD SUPPORT IT. Excellent idea….there will be so much resistance in its implementation as bad guys will not see the HOUSE again. sms based voting, first one will have to increase the level of awareness, and second the language matters as most of people who live in rural areas can’t write english/urdu! Finger Print SysTEm will be more beniefical for voting . to prevent sms frud . The problem is that not many people come to polling booths to cast their votes… we are just too lazy now.. It would be more effective if there would be a way to cast the votes securely while sitting at home..
1. Voter must register for the vote. At the time of registration, voter must provide the Phone number, CNIC and 4 digit pin that he will use to cast his vote. 2. Pin number must be entered secretly at the key pad to be saved encrypted in the database. 3. When the vote is casted, all three pieces of information must be verified with the DB. 4. Confirmation that will be sent back to voter msut not contain the information regarding his vote. It should only confirm that the vote was casted successfully. Lolling hard @ those who proposed this idea. Literacy rate in Pakistan: 55 percent. Total number of mobile subscribers: ~94.26 million, roughly 60 percent of the population of Pakistan. Most of the subscribers have upto five SIM’s registered on one id card. With this system, they are targeting approximately 60 percent of the population. What about the rest? Definitely someone will cast their vote! and everyone knows how! Too much bogus CNIC’s will come into play and too much bogus SIM’s will come into play and It will be the day of the hackers!! YEAH!!! Looks like they are trying to make the existing fraudulent system computerized and nothing else. It’s very easy to criticise the process… do u have any other better suggestion??? Every problem has a solution. Why can’t all the hackers hack all the ebusiness sites? It’s just not that easy. If you deploy a well thought system, it would defintely be hard; if not impossible to break. But it would surely be better then the current manual system where only 30% population casts theer votes and more then half of them are bogus. Bro you didn’t get the point. First of all! any website or software can be hacked. If there is a website that is secure, it is because no one tried to hack it. If this system brings a legit and deservable person for elections then it can be called a fantastic idea. — any website or software can be hacked. Its very long process and people who are not educated what they do? Imran think about all. it’s OK if the uneducated people won’t cast their votes. If there are three people in a room; 2 Jaahil and 1 Aalim.. Shouldn’t what the Aalim says have more weightage then what two jaahil say? This is fantastic idea and need of the day. On line verification of CNIC will minimize if not eliminate the chances of bogus voting. The important thing however would be to educate the masses through electronic media well before elections. Moreover the local bodies elections before general elections be held through electronic ballot. SMS Based Voting won’t work. CLI could be masked. Nice idea from educated person. About the fraud, you can involve GSM service providers also to verify that the person who is sending this sms is coming from the same phone number and his or her CNIC number should match with information of a person at the time of sim registration. When there is a will there is a way…. Computerized voting system is best if correctly implemented. It should work starting with a finger print scan of a person and vote is casted after inputting the cnic number which if matches the finger print, or the process may be reversed. This requires an efficient technology and infrastructure. I am agree with this new service launching by Imran Khan… and me happy to taken vote through sms Imran Khan. E-VOTING is a need of the day no doubt! Fingerprints should be taken as authentication method and voters data should be created by the help of NADRA and voter itself so that voter should register and system should be reliable. And Why the hell anyone tries hard to hack such system ! !